We are very excited at Embers Bristol to now stock the incredibly versatile Kamado Joe. Kamado Joe supply a range of ceramic cookers including the Joe Junior, Classic Joe and Big Joe. The Joe Junior has a 12.5" cooking surface and is intended for easy transportation so think festivals and camping. The Classic Joe is family sized and then some with it's 18" cooking surface. The Big Joe is perfect for bigger events and even compettition use, i know this as one customer purchsed a Big Joe from Embers Bristol to compete at Grillstock Festival. The Kamado design is based on ancient Asian cooking technology and keeps meat incredibly moist. It is charcoal fired so the beuatiful woody flavours add to each cook. 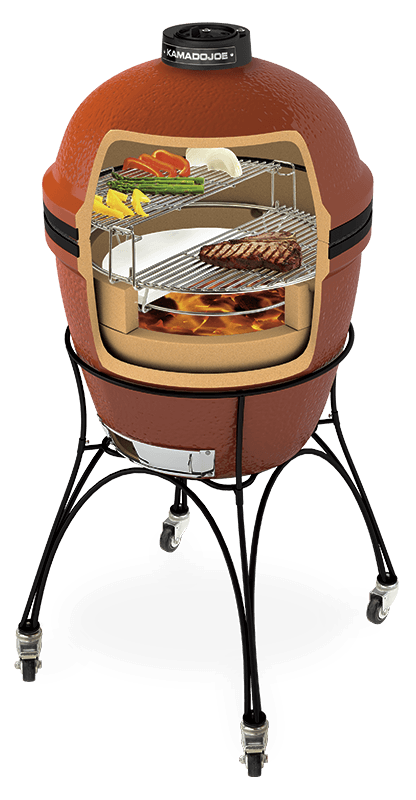 Kamado Joe is no ordinary barbecue but can smoke, bake, sear, grill, roast, do pizza and more. The simple air vents make controlling the temperatures incredibly easy and very quick. You can reach anywhere between 150 - 900 farenheit no problems. To see the full range click here. In the Embers showroom here on St Georges Road Bristol we have the Joe Junior on cold display (not lit) and the Classic Joe on cold & cooking display. Thats correct: every Saturday I attempt a new recipe as I get to grips with the Classic Joe. So far we have succeeded with some simple barbecuing and moved on to some more complex recipes. Below you can see the Kamado Joe Chicken Stand in action. Simply pour beer (and any other seasoned you fancy) into the chicken stand. Pop your whole chicken on the stand and cook for just under two hours. Perfectly moist, slightly beery chicken. We will be out and about in Bristol this summer doing some disply cooking on our Classic Joe and giving away free samples. Coming next is the Cotham Hill Street Party on Sunday the 17th of May. Pop over and say hello and grab a free sample. Currently we are testing out recipes for events but i think the beer can chicken will be one and we may try some DIY bacon too.